Maple is the most common host but many species are susceptible to this fungus. Symptoms of chronic infection include; sudden wilting, leaf yellowing or scorching in a portion of the crown, often on one side. Foliar symptoms are most likely to appear during July and August, when plants are under water stress. Other symptoms of chronic infection include undersized foliage, poor growth, abnormally heavy seed set and twig and branch dieback. Plants may also become severely infected, wilt and collapse in a short period of time. 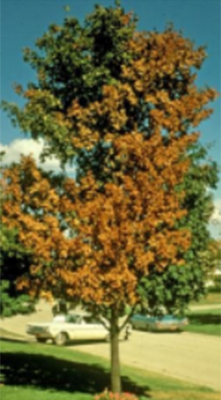 Acutely infected plants may show; leaf curling or browning; foliage or areas between veins abnormally coloured red or yellow; partial defoliation; wilting and branch dieback, often on only one branch or side of the tree or shrub. 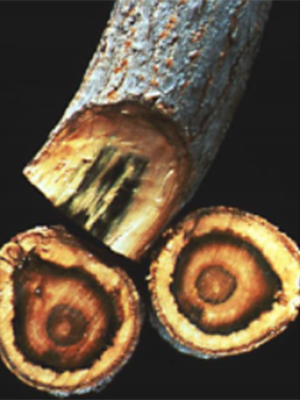 Verticillium Wilt can also cause sudden death of a tree or shrub. The fungus enters through wounds or natural openings in roots. Once inside the plant, it produces spores that move through water-conducting tissues. The fungus is found in soil and may persist in the ground for many years. Olive-brown streaking in the wood is often found in maples infected with this disease. Colours vary in other hosts. Infection causes the sapwood to darken into a greenish-black. This disease is often followed by frost cracks and associated cankers. Confirm your field diagnosis by sending a sample to a diagnostic laboratory for positive identification. Prune wilted branches back to healthy wood. Thin the remainder of the crown. Fungicides are not effective against this disease. Fertilize and water to promote vitality, especially root growth. 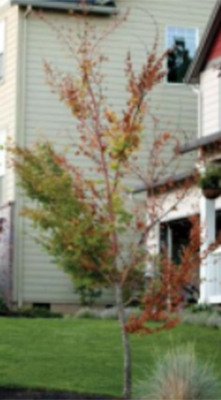 Avoid using wood chip mulch made from trees or shrubs that died from Verticillium Wilt as recent research suggest that the fungus may remain viable for considerable periods of time. Avoid using a susceptible host as a replacement when replanting in an area where a plant has died of Verticillium Wilt.